When a Christian dies, the community gathers for a funeral. First: there is no hurry - the family can take as long as they need to grieve and "accept" their loved one's death. Next: Contact a funeral director, who will help arrange the funeral and co-ordinate with the Parish. 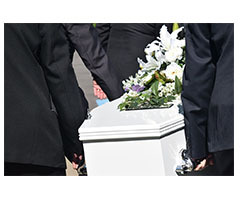 The Funeral Liturgy has a formal structure with a set pattern of readings, homily, prayers, symbols and gestures. It may include the celebration of Eucharist depending on family and other circumstances. In the past this was referred to as a "Requiem Mass". A workbook called "Life is Changed Not Ended" is available to help prepare the funeral liturgy of a loved one or for someone to indicate their wishes regarding their own funeral. It is available from Liturgy Brisbane on phone 3336 9444. If needed, the Parish Office is also available to assist families. Should you require an Organist, Vocalist or Catering Services the Parish Office can provide the contact details of persons who offer these services. If any costs would cause undue financial stress, accommodation for your situation can be made in discussion with the Parish Priest.